Have you seen my post on Six Ways of Incorporating SPF In Your Makeup Routine? I mentioned Benton's Papaya D-Sun Cream there; it is Benton's first product to incorporate both physical and chemical sunscreen. Such hybrid sunscreens are my favourite kind - better safe than sorry! This sunscreen has SPF 38 and PA+++. 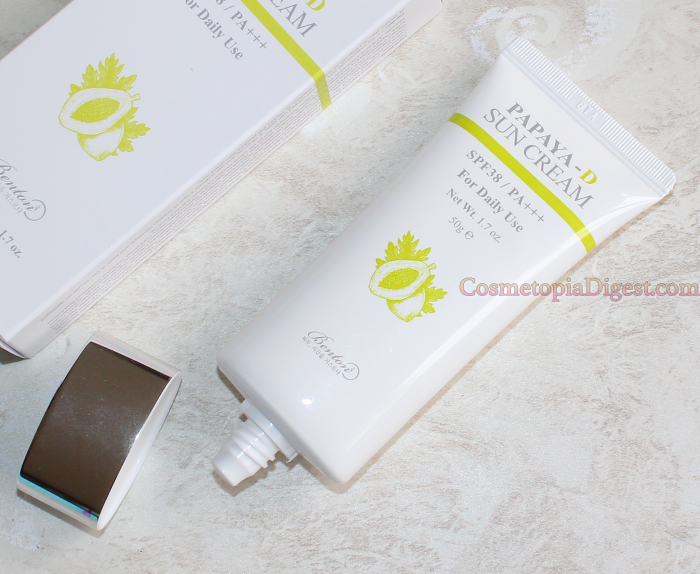 The PA+++ indicates protection from UVA rays, while the SPF indicates protection from UVB rays. For those who came in late, the former causes ageing while the latter causes sunburn. The product contains 55% papaya fruit extract, and papaya seed oil (5,000ppm) - did you know that Christopher Columbus called the Papaya the "fruit of the angels"? 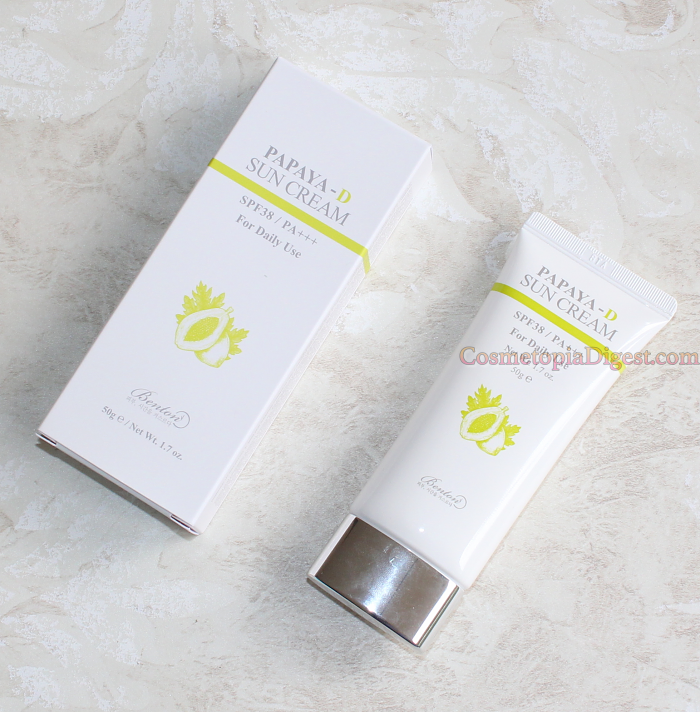 Scroll down for more on the Benton Papaya D-Sun Cream SPF 38/PA+++. This comes in basic tube packaging. You get a great degree of control over the amount of product that comes out. The 50ml tube is travel-friendly. I went on vacay with it and the product stayed put inside despite being squashed by a tonne of stuff in my suitcase. Let's talk about the ingredients. 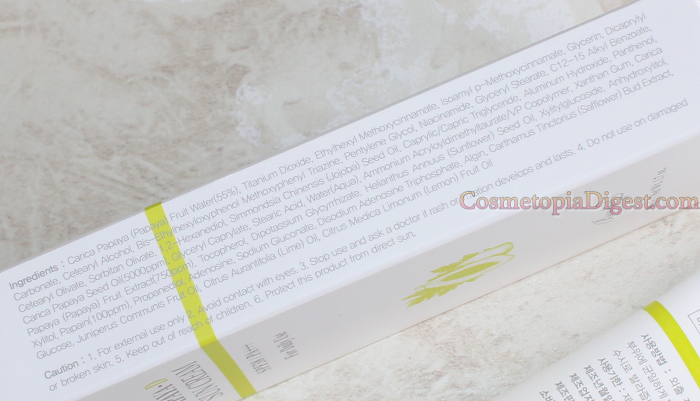 It contains 55% papaya fruit water (750ppm), and papaya seed oil (5,000ppm). Papaya contains polyphenols, minerals, vitamins, and papain - the latter is an enzyme (protease). A word of warning - if you are allergic to latex, you COULD be allergic to papain as well. Apart from all that papaya, this also contains niacinamide (Vitamin B3), adenosine (reduces lines), sunflower seed oil, Vitamin Ca, safflower bud extract, juniper oil, and "Aquaxyl" - which is a glucose-based patented hydrating compound that limits water loss from the skin. Of these, the first two protect from both UVA and UVB rays, while the last two protect from UVB rays. Now. Is SPF 38 enough? I live very close to the equator, and my dermatologist (who is currently doing acne scar revision) tells me SPF 30 protects from 97% UVB rays. I'm surprised that SPF 50 blocks just 98% UVB - there's an SPF difference of 20, and the percentage of rays blocked has gone up by just 1%! I don't soak up the sun during peak hours, though I do get my Vit D while in the car. So yes, for my needs, SPF 38 is quite enough, particularly when you consider that this one gives you UVA protection as well. Here's a look at the full list of ingredients. CosDNA lists "Algin" as a Grade 4 irritant. Now for the texture. It is neither heavy nor light; there's medium thickness; no stickiness. I apply this atop all my skincare, beneath primer. I cannot smell anything specific on the product. It dries moist, and does not feel heavy on the skin. The important question is, does it leave a white cast? See the photo below. 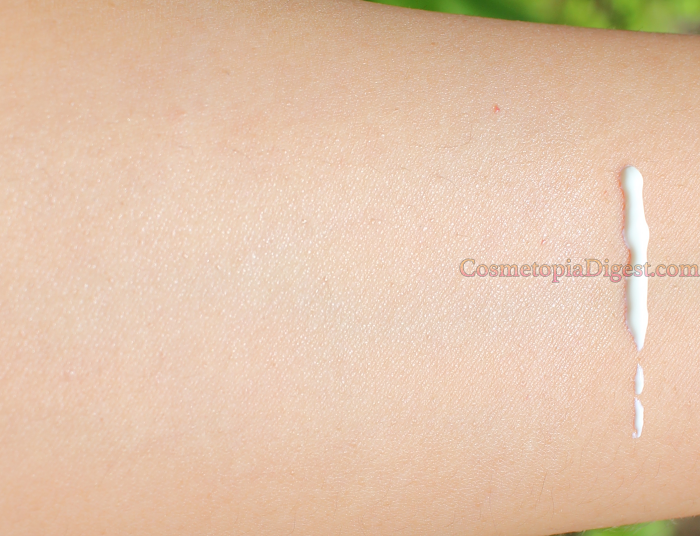 I have the thick swatch on the extreme right; you can see how it's blending out on the middle of my forearm. This is in natural lighting. I don't think it has an evident whitish hue on my skintone. Nonetheless, there is a bit of a shimmer which becomes less as I apply makeup on top. I like the idea of it working as a highlighter! If you are looking for a broad spectrum sun protection product which contains skincare benefits as well, I recommend the Benton Papaya D-Sun Cream. It protects against both UVA and UVB rays, and contains enough moisture that you can actually skip a dedicated moisturiser in the mornings. I do not recommend applying this ABOVE makeup, though! I especially loved the slight shimmery effect of this sunscreen. If you do not use primer, or use a siliconey primer, then this sunscreen gives you a bit of that glowy skin, which is very much coveted right now. Best of all is the price point - this sunscreen costs just $20. To buy, go here - they ship worldwide; this is my favourite K-beauty store, and Alice always includes samples and Korean candy with purchases.